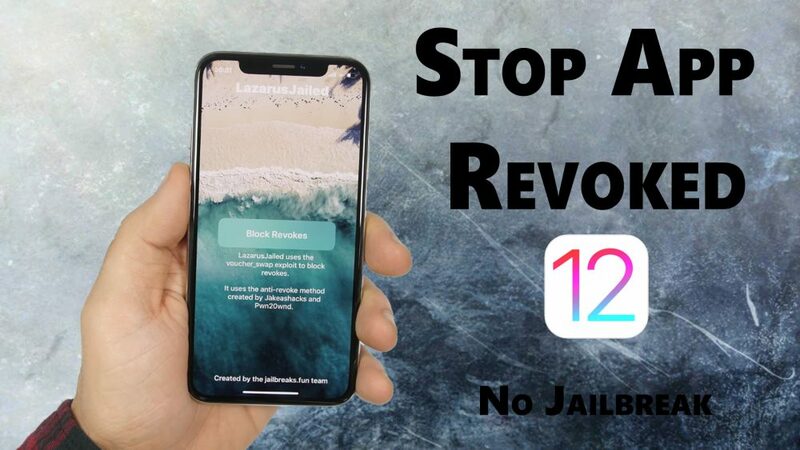 Stop App Revoked On iOS 12 or 12.1.2 – Hello guys, are you using third-party apps and app stores on your iOS 12 device and worry about the revoking then here is a guide for you and in this complete guide, I’ll teach you how you can stop app revoked on your iOS 12 or 12.1.3 devices with jailbreak. As we all know that, Apple doesn’t have any types of tweaked apps on their app store and that’s why lots of iOS device’s users download tweaked apps from the third-party app stores. But sometimes Apple can be revoked them and then you need to install again that app. If you follow this guide then you don’t need to worry about the revoking. because in this article, I will show you guys how to stop app revoked on iOS 12 or the iOS 12.1.2 devices. Now if you use any of the third-party app stores like AppValley or Ignition or tweakBox whatever you use and your installed apps from them then you can use this method to stop those apps from being revoked. So let’s go further and have a look at the guide. The first thing you want to do is open Safari and open ignition.fun. now I will leave it linked right down below the paragraph. so when you are on the website then click on the big red button that says [Use now (web)] or you can install its official app by click on the button below. so when you are on the website then click on the second tab and go to utilities and from here you will need to find Lazarus jailed. So now just tap on it wait for it to load and then click get. you will need to install this app. so click install and wait for the app to download and install on your device. After completing the installing process, go ahead open your settings go to general and go to profiles and device management and make sure you trust this certificate. So that you can use this app on your device open the app and from here all you gonna do is just click on Block Revoke button. This is the button that will help your device stop app revoked. so just click on the button and it should do its thing and it will respring your device once it’s successful. If it doesn’t succeed you need to reboot your device and retry this so do this once more the same procedure just go ahead and run it here and wait for it to succeed it might not succeed on the first try. But most of the time it does. so click respring and if you reboot your device then you will need to do this procedure again. so you will do to run Lazarus every time you reboot your device in order for your apps to stay protected. So this complete guide was about how you can stop app revoked on your iOS 12 or later devices. guys, the best thing about this article is you don’t need to jailbreak your iOS device. so that’s it for this article and thanks guys for reading this article and being with us. Hope you like this and if you like this then please don’t to share this amazing guide with your friends, family members, and on the social media and also don’t forget to visit daily on this website for reading more new articles.